Gakushuin Women's College is a four-year, tertiary undergraduate institution with a two year post-graduate Master of Arts program in Intercultural Studies in its Graduate School, and is authorized by Japan's Ministry of Education, Culture, Sports, Science and Technology to grant the Bachelor of Arts and Master of Arts degrees, and accredited also by the Japan University Accreditation Association. The Faculty of Intercultural Studies is made up of three unique departments: the Department of Japanese Studies, the Department of Intercultural Communication, and the Department of English Communication. The departments of Japanese Studies and Intercultural Communication offer special entrance examinations for returnee and non-Japanese students, English Communication does not. 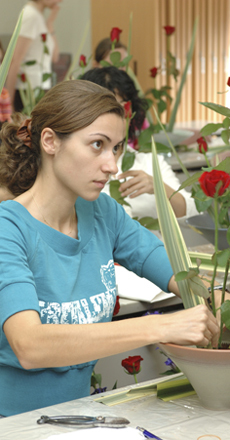 The curriculum has two types of classes, the specialized classes offered to students of each department, and the general education classes open to the students in all departments. During their four years at college, students will cultivate their communication skills in both Japanese and English, study and explore variety of cultures, and acquire practical experience of Japanese traditional culture.